The urgent need to strengthen and encourage ´buen vivir´ for our communities in Peru, by means of strengthening sustainable production, local economies, and associations as alternatives to extractivism, in addition to the care of common goods, in order to face up to climate change and to forge a truly fair and democratic society. For this it is necessary to continue defending Mother Earth, our territories and our right to health so that we, the communities, be the ones that decide our destiny, and so that we can recover the harmony between the economy, society and nature. For this, we stand firm in our definite rejection of the extractive and hydroelectric projects that expand in a chaotic and violent manner in our territories. It is essential to reform our political system and laws which currently back this economic model. One of the hardest and most difficult manifestations of this model is the criminalization of the protest and the repression by the state-owned forces put at the service of the companies, which has cost the lives of dozens of people and has permitted the judicial harassment of hundreds of social leaders and the imprisoning of many of them, as has occurred with our Awajun and Wampis brothers who defended the Amazon and the communities who defend our water. It is time to recover our democracy, so that our rights as communities and citizens are respected. 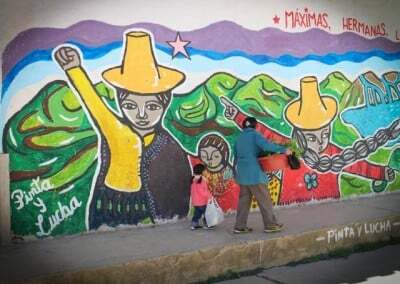 Even though we recognize the advances of our struggles, in terms of proposals, collective decisions and, in territories like Cajamarca, forging legitimate political representation, we also recognize that there is still much to do to strengthen our organizations at a local, regional and national level. For this we believe it is important to advance in strategies of articulation between our struggles, so that our local resistances and the self-determination of our territories, may join forces to transform the country. We reaffirm our identity and rights as indigenous peoples, as peasant communities, as rural and urban ronderos, as Quechuan, Aymaras and Amazonian communities, with the right to autonomy and our own jurisdiction, and with the right to determine our way of life through the consuetudinary right and buen vivir (tajimat tarimat pujut; Sumaq kausay; Sumaq qamaña). We show solidarity and support for the struggle of Cajamarca against the mining activity, likewise, with the 52 defendants for Baguazo* and with Gregorio Santos Guerrero who is unjustly detained. We recognize the fundamental participation of women in social organizations and in the construction of the ways of life that we want, and also in response to the huge consequences that extractivist, racist, patriarchal and sexist capitalism has brought to our lives. For this, we consider fundamental the promotion of the participation and leadership of women – in conditions of parity in all political spaces, as we recognize their contribution to the economy, politics, and culture and their role in the care of life and food sovereignty. Finally we propose to recognize and protect the rights of women to live without violence caused by social-environmental conflicts and the expansion of the extractivist developmental model, which leads to sexual harassment, sexual violence, labor exploitation, contamination, criminalization of the protest, femicide, among others. We vindicate and commemorate our wounded and our martyrs that fought for the defense of life, water and land. The modification of the Law of Previous Consultation in concordance with the Agreement 169 of the International Labour Organization, subscribed to by the Peruvian state, so that it truly enables the self-determination of communities; as well as the modification of the National System of Public Investment so that it allows the promotion of family and communal agriculture and other sustainable productive activities. Immediate freedom for the defenders of Mother Earth, life and of the rights of communities, unjustly on trial or imprisoned across the whole country. Fulfillment of the agreements and commitments assumed by the government in the processes of tables of dialogue implemented in different parts of the country, such as in Espinar, Moquegua, Arequipa and others. Cessation of the expansion of extractive activities in the country and, moreover, that those companies which have operated or that operate at present and have caused environmental and social damages, are obliged to make economic, social and environmental reparations to the affected towns and communities. We demand of the District Attorney and of Congress the creation of a commission of investigation and sanction for tax evasion, specifically the tax evasion of the Yanacocha mining company. We propose the strengthening of processes of decentralization to tackle the concentration of power and the political and economic decisions made by the ´elite´. We will work for the re-foundation of the politics of the country and for the surging of a new institutionalism of the state, decolonizing and breaking down the manifestations of patriarchy in all social, political and cultural connections, seeking harmony with Mother Earth and between communities. PERU, I LOVE YOU, THAT’S WHY I DEFEND YOU!